We have a tendency to treat our pets like babies, and sometimes that creates separation anxiety in dogs. Humans have a desire to nurture anything small, cute or helpless. When a newborn human baby cries, the right thing to do is go to her and offer comfort, food, warmth or whatever she needs, right? It makes sense that we also want to carry our pets around, keep them near us at all times and go to them when they cry. We shower them with affection whenever they display signs of neediness. This is a way for us to express love and feel loved back. But loving a puppy or dog in this way can actually do some harm. It often (not always) results in an anxious, overly dependent, needy and annoying dog. Puppies and dogs are not babies. They are animals, and they have a right to be treated as animals. 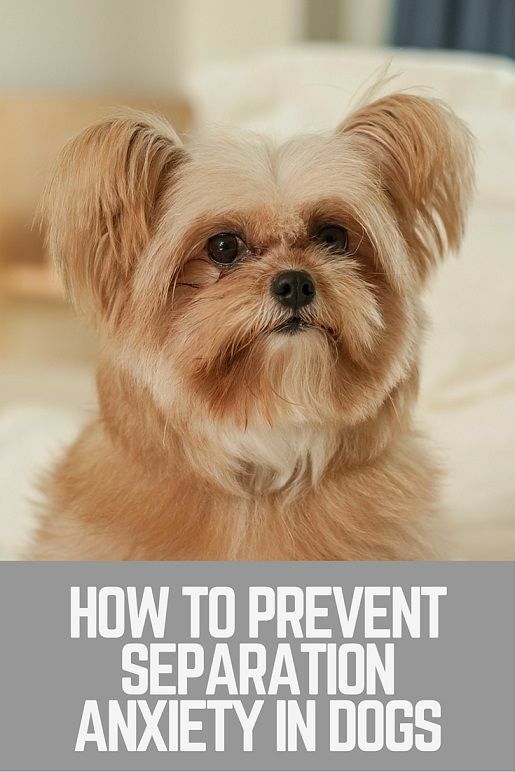 This post has been expanded into an ebook filled with tips on how to stop a dog’s separation anxiety. Order it here for $4. Dogs with separation anxiety have not been conditioned to being left alone and therefore go into a frantic state of mind when separated from their owners (even when their owners are simply out of sight). What is NOT dog separation anxiety? Separation anxiety in dogs is overly diagnosed. All dogs need a reasonable amount of time to adjust to a new home. Most dogs will cry in their kennels for a bit for the first couple of nights or weeks, but then they settle in just fine once they adjust to the new routine. A dog that is given little or no exercise, no mental stimulation (training or puzzle toys) and no time with a “pack” is going to be bored out of his mind. Of course he’s going to bark, destroy property or rip apart his kennel when left alone. He has nothing else to do! 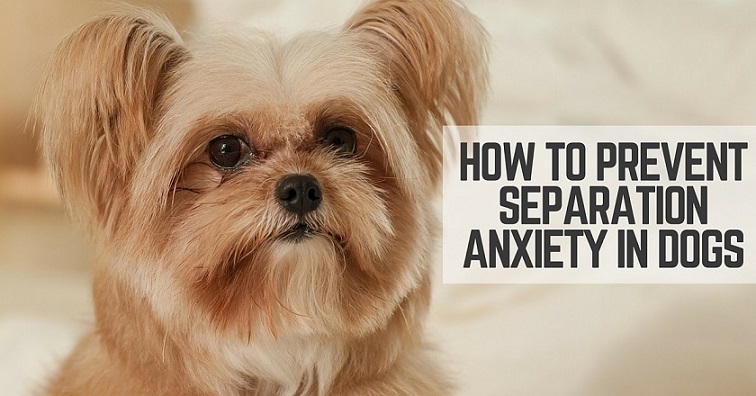 In a past post, I outlined the symptoms of dog separation anxiety and the steps on how to help a dog with separation anxiety. Please check it out HERE. In this post, I want to focus on preventing separation anxiety. How do I prevent dog separation anxiety? 1. Do not carry your puppy everywhere. 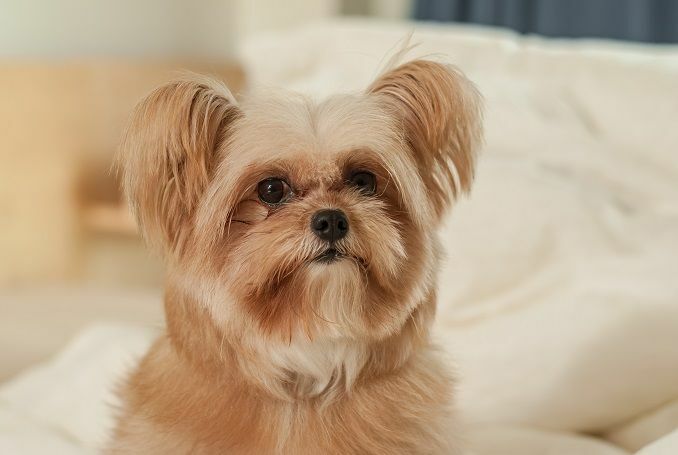 A lot of small dogs develop separation anxiety because they are carried around all the time. They are literally treated like babies. They never have to think for themselves. They are not encouraged to explore or be independent. They never learn proper socialization skills because their owners pick them up when the dogs are faced with anything new. Some of these dogs become insecure, fearful and anxious without their owners in sight. Others become overly possessive of their owners and bite anyone who comes close. This can be prevented by treating the dog like a dog. 2. Teach your puppy to “stay” for long periods of time. All dogs should be able to lie down and stay for at least a half-hour, especially when there are no distractions such as when you are watching TV or checking email. This helps drain some mental energy, builds confidence and self-control. Teach your dog to stay on her “place” or “bed” while you leave the room. If your dog doesn’t have the most reliable down-stay quite yet, keep working on it. Start with just 2 seconds while you’re right next to your dog. Then try 5 seconds and over time you can increase to 10 seconds, 15, 30. Eventually you can take one step away and she should remain staying. Then two steps. It helps if you can give your dog a special chew toy like a Kong toy or a puzzle toy while she stays on her bed. 2. Do not pick your puppy up if she cries or jumps on you. This is the kind of behavior you do not want to reward. Unless she is truly in danger, completely ignore your dog when she cries or jumps on you for attention. Do not look at her. Do not scold her. Get up and leave the room if you have to. Your attention is a reward, and she only gets it when she is being calm and quiet and respectful. By the way, I’m not saying it’s wrong to pick up and cuddle your dog! But if you are worried she is becoming too dependent on you or if she’s showing signs of separation anxiety, setting these boundaries will help her gain confidence in the long term. 3. Reward your dog with attention when she is calm and quiet. A reward can be something as simple as eye contact, a pat on the head or a treat. But this is also a good time to pick your dog up! 4. Purposely separate yourself from your puppy. You and your dog will naturally want to be together, but you can’t be together all the time. It’s important to help puppies learn to feel comfortable being separated from you. Make sure you are creating these scenarios, even when you are home. Tether your dog to a chair or table and walk away. Return only when she is quiet. This could take a few minutes. Heck, it could take an hour! If your puppy won’t stop crying, just wait her out and return when she has been quiet for even 3 seconds. If she starts celebrating and barking as you approach, turn around and ignore her again until she is quiet. Having your attention is the greatest reward for your dog. Kennel your dog when you are home. This could be for 10 minutes or an hour. It’s the same concept as above. Only return when your dog is quiet. Kenneling your dog when you are home will also help her feel more comfortable in her kennel because she won’t associate it with you leaving the house. 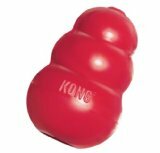 Make sure to stock the kennel full of goodies like Kongs filled with frozen peanut butter and treats. If you have a pup who follow you into the bathroom, then close the door in her face and make her wait for you. This is an easy way to create temporary separation. If she scratches at the door or cries, do not open the door. Opening the door is too much of a reward. Don’t let your puppy crawl into your lap unless she sits quietly first. Don’t let her sleep in your bed until she is a confident and well-trained dog. Puppies do not belong on the bed. 6. Stick to the same routine before you leave your dog home alone. Sticking to a routine when you leave will really help your dog feel secure. Before you head to work, maybe you go for a 30-minute walk with your dog, then shower, then eat breakfast, then put her in her kennel and then do your makeup. 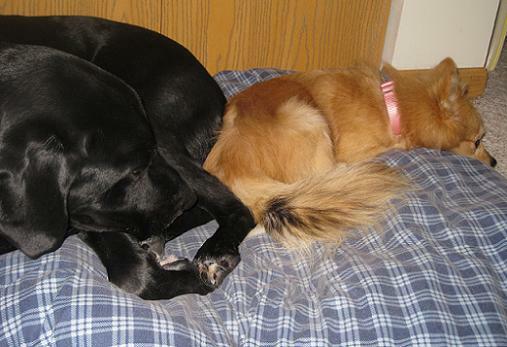 Dogs really depend on a routine to help them feel secure. 7. Ignore your dog 20 minutes before you leave and 10 minutes after you return. Making an event out of coming or going confirms that being apart was bad. Being apart is not bad, it’s normal. So, completely ignore your dog before you leave the house (just for 10 minutes or so). Don’t talk to her. Don’t make eye contact. Don’t even look at her. Drawn-out goodbyes will only make her feel anxious. She will pick up on your feelings of guilt. When you return, do the same. Do not look at her or acknowledge her at all (this is hard!). If she is barking in her kennel, that gives you even more reason to ignore her. If you don’t kennel your dog and she greets you by jumping and crying, walk into another room like she doesn’t exist. Return when she is relaxed. If you know she can’t relax, then simply have a Kong toy filled with peanut butter you can drop on the floor as you walk in the door and into another room, ignoring her. Return in 5 or 10 minutes. This is the perfect time to take her for a walk. 8. Leave your puppy with a friend. If you have an understanding friend who loves dogs, sometimes it helps if you can leave your dog with a friend for an hour here and there. This helps the dog associate positive experiences with people other than you. If you are the primary caretaker of your dog, it can also be helpful to have other family members step up and take over some of the important roles like feeding the dog, training sessions, play or walks. This is especially important if your dog seems overly attached to you vs. other family members or roommates. Tip: Dogs usually love whoever takes them for walks! 9. Leave your puppy at a dog daycare occasionally. I’m not saying you have to take your dog to dog daycare every day or every week, but it’s good for dogs to get out and stretch their boundaries every now and then without their owners hovering. It’s good for the owners, too! It’s so hard for me to leave Ace somewhere overnight, but I know it’s good for me! I’m probably the one with separation anxiety. 10. Make sure all of your dog’s needs are being met. Dogs that are not given any physical, mental or emotional challenges on a daily basis will likely be very anxious, hyperactive and “crazy” dogs. Be fair to your dog and provide her with the daily exercise and training she needs. Spend time with her. Stretch her boundaries. And never assume that small dogs or “lazy” breeds do not need exercise. They do. 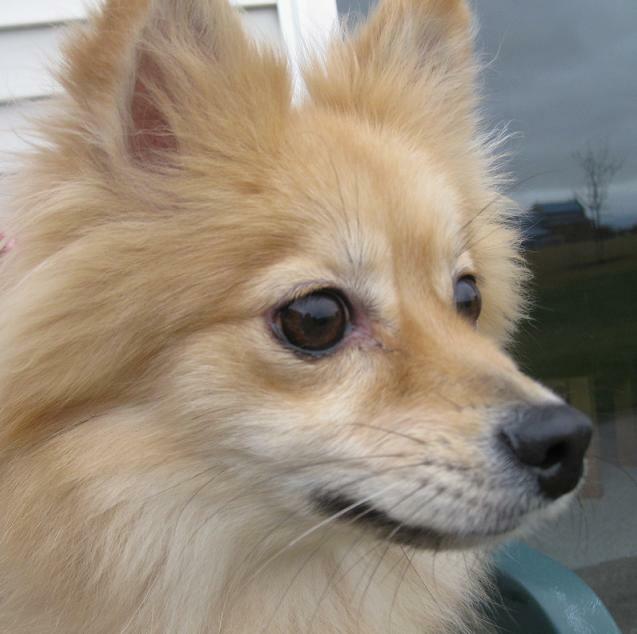 I fostered a Pomeranian mix named Elli who came to us with severe separation issues. How did I help Elli? I took her biking every day to get rid of her pent-up energy. She was about 9 pounds, and she would run 2 miles next to my bike with no problem! She loved it! For more information, see my post on common sources for dog anxiety and what to do! What additional tips do you have for preventing separation anxiety in dogs? Separation anxiety is very time consuming to correct. It is stressful on the owner, the dog and all other family members and pets – and neighbors! Get my ebook filled with tips to help a dog feel comfortable home alone! Available here. I think you have great tips here already. One other thing I liked is Amichien Bonding. Kind of base on the dominance idea, but very dog friendly and non-confrontational. We tried it ourselves and it did work for our purpose. I don’t know what exactly is considered Amichien Bonding and what is not, but I do use a lot of those ideas such as eating before my animals when it’s convenient and walking through doors ahead of them, etc. Not that it always works but sometimes a buddy is another good thing to get with a dog with slight separation anxiety. One of the reasons we adopted Belle was so DOG would have someone to be with when left alone. However, we learned real quick that getting another dog and then leaving them alone together can cause fights. Thankfully we only had one with an actual bite and have since learned our lesson on routines. Once these problems were addressed and our adjustment period ended (6 months) we have two buddies that love each other and love us! Thanks for the post Lindsey! Yes, this is an option and sometimes it does help. You have to choose the new dog very carefully. You don’t want to ADD to the problem. When choosing carefully, what should you be looking for? I have a 5 month old dog who has had separation anxiety since we brought him home at 8 weeks old & nothing is alleviating it. We’ve consulted a dog behaviourist and tried everything, but he’s still beside himself when left alone. He’s ok when my dog sitter leaves him with her dogs so I’m inclined to think a companion dog will help. He’s quite submissive with other dogs, but playful with smaller and younger dogs. Can I ask what you ended up doing here? I feel like I’m exactly in the same boat as you were!! My ex had a dog going through a lot of the issues you have explained. It was his baby, in a sense, and it was a black Labrador. The best thing he did which you have listed was not giving her any attention when the dog was bad or begging for attention and rewarded her when all was calm and she was being well-behaved. I also believe that its hard to train a dog when not all their needs are met, so I am glad that you have included that tip as well. It’s amazing the energy that can come out of a dog daily (especially when you have run 2 miles with them and they are still raring to go!). Oh I know what you mean about their energy! They can run for a long, long time! I’m pretty sure Gus has it pretty bad but we have him with us or at daycare all the time. We don’t mind it at all, in fact – we want him with us because we totally love having him around. I think we are just as bad. When we go play golf or something we can’t wait to get to the daycare to get our big silly. Oh well, it works for us! Well Gus also came to you with separation anxiety, right? Poor guy. I can’t blame him, considering he lived in, like, five different homes before he found you guys. He’s lucky he has owners who are so loving and understanding. And you are lucky to have him! I’m glad your schedule allows you to work around Gus’s needs. You must have an awesome dog daycare. Which daycare do you use? I wouldn’t mind checking out its web site. I’ve had dogs all my life and fortunately have never had one that suffered from separation anxiety, so I’ve never worried much about it, but I know it is a huge problem for some. My main piece of advice would be to start leaving your dog/puppy alone as soon as possible so they get used to the concept from the start. I love my dogs, but we all need our space at some point! It’s unhealthy for everybody if you cannot separate. Sometimes I think its actually the owner’s problem. They “cannot separate” from their dog. Great info here for helping those with this problem. I have a GSD rescue dog, that came to me with seperation anxiety issues, the worst being my dog self mutilated when left alone. This dog had been battered and abandonded many times up to 9 months old. The man at the kennels said he put her up for sale as she was breaking down in the kennels. My rescue dog will be 2 in a few konths. It’s taken me months to stop her from self mutilating herself (biting/scratching herself until she bleeds). This dog has never been tryly alone. She sleeps in my bedroom on her bed. I have often thought about putting her downstairs to sleep alone but I feel it’s the wrong thing to do. Why would I want to reinforce the very problem she came with ‘seperation anxiety’?. Why would I want to make her even more anxious???? Because in reality you can’t be with her all the time. If you are fortunate enough to have a schedule where you can have her with you nearly all the time, then maybe you can make it work. But the average person can’t be with her dog every second of the day and night. It’s completely normal to be apart. your article is wonderful. i’m in desperate need to stop my dog’s seperation anxiety fast, especially because management of our apartments has sent us a letter stating she has gotton complaints of constant dog barking. i never even knew my dog, Mia, did this until now. we adopted her from SPCA about a month ago, where she was a very quiet dog, she didn’t even bark at the other dogs being walked by. she’s approx 2 years old. management says if the barking doesn’t stop then we will have to permantely remove her from the premises. when we first adopted her we had a crate for her because we were told she was only partially housetrained, we found out that she is fully housetrained so took the crate back. have no problems with her while we’re home. but after the complaint i set up a camera in the bedroom where she stays while we’re gone to confirm that she does, indeed, bark excessively. the video cut off after 2 hours, and the first half an hour she barked non stop. we bought PetSmart Indoor Bark Control, left for a half an hour today and the bark control that lets out a high pitched 2 second noise when it senses barking, didn’t really seem to bother her. Other than that, thats the only thing she does. No destruction, no pooping or peeing. Just scratches on door a little and barks…not always at the door either. I’m at my wits end, afraid I’ll be forced to get rid of her…. Ugh, I’m so sorry you have to deal with separation anxiety/barking. It’s very stressful! Does she bark in the crate? Could you take her to dog daycare? Is she getting enough exercise? Have you considered trying an e-collar with him with a remote? Put it on him, leave the room, give him a correction the second he barks. Return the second he is quiet. Repeat. Repeat. Repeat. It’s not an option I like to recommend, and I would only recommend it to someone with experience and understanding of how e-collars can work in certain situations. Worth consideration as you’ve tried everything. I’m sure you’re giving him enough exercise, but if not, make sure you are. Jack Russells can run 10 miles a day, no problem. I’m glad I found your blog. I recently adopted a dog that was hit by a car and then stayed in a vet for a couple of months while he recuperated from a broken pelvis. I was happy to adopt him because he’s such a nice, friendly dog, but I didn’t count on the separation anxiety, and now that I’ve read up on it, it seems like it’s even worse in rescue dogs. If I leave the room or put him outside, he first whines for a few minutes before crying/baying very loudly. He’s a mix, seems like he’s part beagle or some kind of hound dog, and about a year old, the vet says. I’ve tried much of what I’ve read here and on other posts, but I’m a little worried about using the shock collar. I have one, but a couple of times when he’s been scratching and crying at the back door, it seems like a shock just gets him more upset. I only began using it because his progress seems to be so slow – one week he’ll cry for a few minutes after I leave for work, and other times he apparently cries for hours. Do you think using a shock collar or a bark collar would make things worse for him? How about a citronella spray collar? An e-collar can work. I would only use it if you’ve tried everything else. Has the dog been given adequate exercise? I’m talking an hour or two of running per day? Mental challenges like obedience training? Things to do when you leave like Kongs and interactive toys? Have you had the dog for more than two weeks or so? Almost all dogs will have an adjustment period. If you do use an e-collar, I recommend one with a remote so that you can control the timing and intensity of the correction. And make sure you use positive reinforcement as well. Give a correction for crying, followed by you returning to him when he’s quiet. Good luck! I truly understand how frustrating it can be! Just be patient and understanding. The dog has been through a lot. Thanks! I’ve had Butler for about a month full-time now. Before that, I kept him for a few weekends just to get him out of the kennel at the vet for a change. His pelvis was broken in two places and the vet said that keeping him confined so he couldn’t get too active was the best thing to do while he healed. Now that he’s at my place, he has the run of most of the house, and I put him outside in my large, fenced-in backyard for the day, where he’s got several toys and a Kong stuffed with treats and peanut butter. He doesn’t get as much running as you recommend, but that’s because he’s still recuperating. Our 30 minute walk around the neighborhood last night tired him out and he was noticeably favoring his leg again. I’m just worried because he seems to be regressing a bit. Today and yesterday he refused to go outside when I was getting ready for work in the morning, but by the time I left I could see him working on his Kong. Like I said, I’m just concerned because the training we’ve done (much like what you’ve recommended in your links) doesn’t seem to have a whole lot of pay off so far. We’ll keep at it though, and thanks again! How does he do if he is left in a kennel? Terrible. We thought he would do great, because he didn’t have any problems at the vet with being in a kennel. The first time I left him in there for an extended period of time, about two hours, I came home to find that he’d been so panicked when I left that he had chewed and pulled so much on the kennel (it’s metal) that I had to bend it back into shape before I could open the door. Afterwards he would tremble all over if I tried to put him back in, so I stopped and began to re-introduce it to him slowly by putting his food and treats in there along with his bed and blankets. He goes in willingly now, but he won’t make it more than a minute or two before he starts crying and pawing at the door again. I keep trying baby steps though. A few minutes here, a few minutes there. The problem is that if he doesn’t want to go in, I don’t want to force him in there and end up taking two steps back from where we are now. That’s hard. Sorry to hear that. Just be patient. Sometimes these things take a few months or longer, unfortunately. How long does it take to get a puppy or young dog used to being away from their owner for a few hours or more? I am getting a puppy and I would like to know how long I need to prepare her for my absence a few hours each morning (and some afternoons but never without lunchtime visits). Is is a few weeks or months (I could do either)? Thanks. Depends on the dog. Really young puppies shouldn’t be left for more than 2-3 hours anyway because they can’t hold it that long. But the adjustment period for being left alone is different for every dog. Some puppies are fine right away with no issues. Others take months to feel OK being alone. If you are consistent and start leaving your puppy right away on a routine, you shouldn’t have too much trouble. The main thing is to ignore any barking/crying. You want the puppy to learn that acting this way will not get him what he wants. It also helps if you start leaving the pup alone for a few minutes right away when you bring him home. Don’t let him be with you 24/7 or you will be creating a pup with attachment issues. You have great advice. But never should you leave a dog in the car! Thanks, Shirley. I disagree, however. I leave my dog in the car all the time while using common sense. I just adopted a six month old puppy and he already has MAJOR anxiety even though I’ve only had him a day and a half. I can’t even leave the room he gets so upset. I left him alone with my other dog for about two hours today and he had destroyed the door frame around the door we leave thru and ripped up all the carpet in front of the door! He also attacks my other dog if I try and show him any attention or if he has a toy new dog will attack him. He’s gouged his ear pretty good and is limping! I need help! I’m afraid to go to work come Tuesday! Unfortunately there is no easy fix for this. You are going to need a lot of patience. You will also want to think seriously about whether or not you can deal with separation anxiety and keep this dog. I’m not sure what your living situation is as far as an apartment or a house, close neighbors, etc. You will definitely want to put him in a crate. He will probably try to break out of it and might succeed. Give him tons of exercise, like an hour of running in the morning and at night. Leave a radio on. Give him lots of puzzle-type toys where he has to work to get treats out. Do not make a big deal about coming and going. You could also consider taking the dog to dog daycare at least a few times during the week to help eliminate some stress for you and your dogs! That way you can go to work without worrying all day about what’s being destroyed. Since you have problems beyond the separation anxiety, I highly recommend you contact a trainer in your area. Thank you for your comment. Let me know if you have any other specific questions. Best of luck to you! Another thing you need to keep in mind is that you JUST got this dog. Every dog needs time to adjust to a totally new environment. The first week I had my dog, he barely knew what was going on, let alone any semblance of structure. He would bark if I left the room. Three months later, he is very well-adjusted. I would highly recommend keeping a rigid schedule, but also know that he will adjust over time. You do want to work with negative behaviors from the start to show him aggression and barking are NOT ok, but also try to remember that he is going through a LOT right now and WILL adjust. What a great and in-depth article you’ve written! So many owners actually bring this problem on themselves without even realizing it, by babying the dog and making a big deal out of the separation. Our cockapoo hated it when we’d leave when he was still a puppy, and it was really because we didn’t have a lot of experience with dogs and got ourselves worked up about leaving him alone…naturally he sensed it and got worked up, too. The tip on ignoring the dog for a while before you leave is great, we used that method with a lot of success, along with some of the other ideas you mentioned. Crate/kennel training also did wonders for his behavior. Thanks for the hard work, great blog. People feel so guilty and stressed about leaving their dogs home alone – no wonder so many dogs have separation issues! If I put Ace in his kennel and feel sorry for him, of course he’s going to whine. But if I put him in there thinking how lucky he is to have such a good home, then he will go right to sleep. He truly gives me whatever behavior I give him. We just got a Newfoundland/Great Pyrenees puppy named Bernie. We have had him one week and he is currently 9 weeks old. He has learned to go the door to be let outside to go to the bathroom. My concern with Bernie is that when he is placed in his crate he cries and barks for a good 20 minutes. We let him out every 2-1/2 hours during the night to go outside to use the bathroom and every time he is placed back in his crate he cries/barks for 20 minutes. Your article has some good advice. I’m hoping to implement some ideas with Bernie. But do you have any idea how long this crying will last? Will a bark collar calm him down? 20 minutes is no big deal. Your best bed is to ignore him 100 percent when he cries. You have only had him a week so he is just getting used to the routine. Don’t give him attention now at all for crying or he will learn that crying gets him attention. You don’t need a bark collar at this point. That barking is normal and it should go away in a week or so. I would also let him out every 3.5 or four hours pretty soon rather than every 2.5 hours. He should be able to hold it that long. i brought my puppy home about a mouth ago from my parents. The dogs there ran at the opportunuty to reproduce before getting fixed and had a litter of 6. My boyfriend and I kept one, Paige. When we brought her home, it took her some getting used to, but she adapted very quickly. She’s 3 months now and all in all probably the most amaxing and intelligent dog I’ve ever had. The problem is when we got her, I wasn’t working at the time, so I assume she got overly used to having me at home, now when I leave the house to go to work she goes nuts. Scratching at the door, at the floor, crying and whinning. She NEVER barks however. But she will stay planted there until I get home. Ny biyfriend comes home before me, so she will calm down and stop, but as soon as she hears the door when I come in she goes at it again until I’m in plain site. I always leave all her toys for her to play with, and we have a kitten, Sony, who is 9 months that she always lived to play with (until the house is empty). I take her for contstant 30-45 minute walks, and take her to the park as often as possible to run around, if not we’ll play with her out back. She’s used to having rooms seperate us, and she’s okay with it, it is just really wben I leave the house, and we have neighbours who live upstairs from us who have complained about her for the mere 2 days that I have been gone so far, and our landlord has said that if it doesn’t stop she’ll have to go. I just don’t know what I can do to get her out of being scared to be alone withiut leaving her alone, but as soon as I do and she starts we’re getting a complaint. It’s hard to be able to train her withiut actually being able to. Any suggestions? I’m in such a rut and so broken up over it. Unfortunately there is no quick fix, so I highly recommend you apologize to your neighbors and explain to them you are working on the issue. Send them a thank you card or some cookies if that will help. You are going to have to get your dog to accept being away from you. So even when you are home with her, do not allow her to obsess over you at all times. Completely ignore her when you come home for at least 20 minutes, until she is calm. In general, only give her attention when she is calm. And by attention, I mean even just looking at her. When you are home, purposely create some separation by leaving her in different rooms and returning to her when she is calm and quiet. Don’t allow her to follow you everywhere like into the bathroom. I recommend you do not let her sleep in your bed for now. 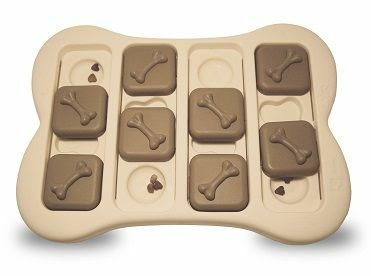 Do all the usual recommended ideas such as leave her with three or four Kong toys filled with peanut butter and dog treats and frozen overnight to make them last longer. Leave a radio on. Get a Thundershirt to possibly help her feel calmer. Increase her exercise. I always suggest getting a kennel and training the dog to use that. In her case, this might increase her anxiety but it would be worth crying. If dog’s can accept being in a crate, they can usually remain in a calm state of mind and take a nap or chew on a bone until their owners return. It becomes their safe, calming place. You could also try taking her to a dog daycare or hiring a dog walker. I moved about 3 months ago and my dog was great! Loved the house and didn’t have any problems. Within the past 3 weeks or so, he barks and cried when we leave the house and if we are home and not in the same room as him or giving him full attention he has accidents, cries and physically shakes. The worst time is in the morning when my husband leaves for work and I am still in bed. Other time this occurs is when we either have guests over or just are not paying full attention to him. I have been thinking about starting from scratch and crating him but I am not sure if that will help the problem. Yeah I think that is a good idea. Start from scratch as though he is a new dog you just adopted. A crate might help him feel more secure in his new environment where he is not quite sure what to do. I’m guessing he felt some anxiety this whole time after you moved but it started out small and no one really noticed it. I adopted a Shih Tzu just a week and a half ago. He is an excellent dog, very lovable and calm. He wants to be by my side most of the time because he didn’t get any love at his former home. He was allowed to run loose in the streets and as a result, he was taken from the owners. I am retired, but I still have commitments and have to leave the house on occasion. When I do, he cries from the minute I leave until I come home. He was neutered this week and has the cone-collar on. It is attached to his collar. While I was out last night for 3 hrs., he cried and barked the entire time and managed to get that cone-collar off his head. I was mortified because it also meant that he was licking at his wound. He scratches on the door. I know I’ve had him just a very short time, but it makes me afraid to leave him. I live in an apartment and I close off the bathroom and bedroom; leaving him access to the living room and kitchen. I take everything up that he might get into, but he stays right at the door the entire time. This article has been helpful and I will definitely try the suggestions. I’m just so frustrated. I’m not hesitant to be away from him, but fearful of what he’ll do while I’m gone and also afraid of the disturbance he’ll create for my neighbors. I confess that I have let him up on the couch next to me and also on the bed. I always said I’d never let the dog on the bed, but I did give in because he’s so darned cute and lovable. I think I’m living to regret that already because he’s too close to me. The first thing that caught my attention was that you said he wants to be by your side at all times because he “didn’t get any love at his former home.” I know you love and feel sorry for this dog, but one thing you can do to help him is to not feel sorry for him. He is no longer in trouble. He is a very lucky and loved little dog. So make sure to create some boundaries between you two every day even when you are home. Make him stay in another room for an hour or so even while you are home. Make him sleep in a kennel or on the floor or in another room. Make him sit on the floor while you are on the couch. Do this for at least the first few months and you will help him build his confidence. Do not give him attention if he is naturally a “whiny” dog when you are home. Ignore all crying. I know it’s hard and frustrating! I hope some of these ideas help! How do you combine house training – where you need to keep your dog near you all the time when she’s not in the crate to make sure she’s not relieving herself – with training for separation anxiety – where you’re supposed to leave her alone for periods of time? These seem at odds with each other. I suppose I could do the separation anxiety training in the crate – but that starts to feel like every minute she’s in the house, she’s in the crate, which seems unhealthy. That means during the day she’s alone in the crate, then back in the crate for separation anxiety training in the evening when I’m home, and then she also happily sleeps in the crate in my room at night….so it just seems like too much time in there to be healthy. Yeah, they are at odds with each other. It can be hard. Does your dog actually have separation anxiety? Or are you just trying to prevent it? I run into this problem all the time when I foster dogs. Sometimes they come straight from the pound and they have a lot of pent-up anxiety and I don’t know if they are fully housetrained. I never give these dogs full freedom for the first few days. The good thing is you can decrease their dependence on you even when you are in the same room. I will sometimes put their leash under a chair leg or table leg so they can’t be right next to me while we are in the same room. Or, I will simply ignore the dog while it’s loose in my office. No eye contact, no petting, etc. Or I don’t let the dog sit in my lap or on the furniture while we are watching TV. It’s little things like that. As far as the kennel goes, I get what you are saying. I hate to have the dog in their for so many hours as well. Think of it as a temporary thing, and get out for as many walks and play sessions outside as you can fit into your schedule. If it’s a possibility, you could take the dog to daycare even once a week just for some extra interaction, socialization and exercise. I wouldn’t make it a daily thing because the dog needs to get used to your routine. But it can be a nice break once a week. just a final comment – i am already giving her long walks in morning and evening, and will do day care a few days a week. Oops. Just saw your comment that you are already taking the dog to daycare. I think that’s great! Love what you said about crate training! One of my problems is that I can’t seem to find any treat that my dog will obsessively work on for more than 5 minutes or so. I’ve done bully sticks, kongs, elk antlers, bones soaked in chicken broth and stuffed with goodies, etc. I have filled the kong with everything from peanut butter (hates it), to his FAVORITE treats, to wet dog food. I’ve had the most success with the last one, but once he has licked enough out that he can’t easily reach anymore, he’s done. I really would love to find that one chew that he will stick with when I’m gone. It’s hard enough to get him to chew on anything once I’m gone since he gets all worked up with anxiety that he doesn’t think about anything else. We’re working on the slow separation process, but I just know it would be a lot easier on him if he could work on something with his mouth while I’m gone. Do you have any other suggestions? Raw hide is definitely not an option. What about making the Kong’s easier to get the food out at first so he is successful? Fill them with a bunch of small treats so they fall out pretty easily. I tried to think of some other chews/treats he might like but if he turned up all the others, I am not sure what he would like. This sounds gross, but what about a bit of that spray cheese in a Kong? EZ cheese or whatever it’s called. Gosh. I’m not sure what could work! Some of the dogs I’ve fostered wouldn’t touch food when I was gone, either. It didn’t matter how tempting the food was. 2 days ago we got a Shar Pei puppy she is 10 weeks old and unfortunatley the previous owners did not get her vaccinations doen at 8weeks, so she is a little behind on her immunisation. Therefore, the vet recommended we do not take her for walks untill she has them completed in 3 weeks time. She also follows me wherever i go, shes my shadow. I let her only on the sofa when she is good and calm and have started to leave her on her own in the kitchen while im there and only go in when she is calm and not whinging. We do go out and leave her again in the kitchen with bed and toys and she does cry & bark (well tries to bark). Because we cant walk outside for another 3 weeks im worried she is going to get bored, we do take her in the garden as we trying to toilet train, but am i doing all I can? Well seeing as you’ve only had the pup for about three days, I would just give her some time to adjust. Stick to a strict routine. Most puppies will cry for the first night or two. This doesn’t mean your pup has serious anxiety. Can you walk with her around your own yard where she won’t be around other dogs? And how about playing some tug of war games with her? That could help burn some energy and take care of some stress. It’s also never too late to practice obedience – sit, stay, come – in short sessions. Also practice good leash manners by walking her around your house on a leash. Your article has really helped me understand more. I think I have more separation anxiety then my dog does. I have a 5 month old Basset Hound and I have a place for him in the basement to sleep or hang out and play. He always whines and barks when I leave but after a couple of minutes he stops. I usually feel horrible for leaving him alone so I go get him and play with him. I know its bad because I’m spoiling him but I feel horrible for leaving him alone. So I try to be with him the most as possible. So I guess my question is how many times should I leave him alone? The majority of the day? I just dont want him to be lonely but i still want my alone time. Hes well fed, I walk him 3 times a day, and he has enough toys to keep him busy. So what should I do? Please help. Thank you for reading and commenting. I’m glad the post has helped you and your dog. I know what you mean. I totally have a bit of separation anxiety when I’m away from my dog, too. When you do leave your dog, try not to feel sorry for him. Think about what a lucky dog he is to live with you in a nice place. He gets to stay at home with nice toys and a climate-controlled setting while you have to run around and do errands, go to work or school or whatever it is that you do. Think positively, and it will really help him. As far as how much time your dog is alone, do what works for your schedule. Many dogs stay home for 8 hours per day while their owners go to work, and they are just fine. Ideally, you should be home at least every five hours to let your dog out. And I say, spend as much time with him as you can. Spend as much time with him as you’d like. But also make sure you are still able to maintain a life without your dog. Leaving him home alone for at least an hour every day will be healthy for him. And also leave him in the basement alone for a half-hour or so even while you are home. This blog is really helpful, we recently took on an 8 month old mini dachshund that was left alone in his crate for 8 hours a day. We’ve only had him 10 days and I know we need to be patient with his learning to feel secure. The first three nights he barked for an hour before sleep. We decided we didn’t mind him sleeping in our room and when we moved him into our room he snored away all night. We live in an apartment building and our neighbours are friendly – we’ve told them about the new pet and hopefully they will be patient. We’re actually not supposed to have pets so don’t want any problems. We re sorting doggie day care but of course there will be other times when we want to go out without him so really need to get him used to be alone. Today we spent 5 minutes outside and he barked and barked. I guess tomorrow we keep at the 5 minutes. He is able to be in a different room to us in the house so it could all be settling into the new home. Wish I could see in the future to the day he can stay home without barking. It’s hard, I know. Keep being patient. Buy your neighbors a small gift for their patience, too, if you think that would help. Keep leaving for short periods and returning the second he is quiet. If you notice he gets anxious because of a certain “trigger” like you picking up your keys, then try to desensitize him to that action by picking up your keys 20 times per day when you are NOT going to leave and give him a treat instead. If it’s the kennel he has an issue with, keep putting him in there for short periods (a few seconds, even) and return to him before he has a chance to cry and bark. Keep it positive. Keep giving him his favorite goodies in the kennel. I would try leaving for literally only about three seconds and then return to him before he has a chance to start crying. Do that several times in a day. Then increase to 20 seconds and so on. I realize this is not always realistic because, hello, sometimes you have to leave your dog alone for hours. So, when you do have to leave to run errands or whatever, try not to let him out until he is quiet. The longer he is quiet, the better, but if he is really worked up and anxious, you might have to go to him when there is just a two-second spurt of quiet. I’m assuming you have some Kong-type toys you can give him filled with peanut butter or other tasty things? That helps for a lot of dogs. Every dog is different. Most dogs need a good two weeks to adapt. And then if they truly have separation anxiety it can take several weeks or months. It is a good sign that your dog is able to be separated from you by being in a different room when you are home. Keep looking for little ways to create minor separation even while you are home such as putting him in another room for a few minutes or tying his leash to a chair a few feet away from you while you watch TV so he’s not always right next to you and so on. Keep rewarding any quiet behavior and ignoring any whining/barking. Hi Lindsay, day three of separation training and we’ve seen no improvement. He even ignored his big bone treat we left today (kong should arrive next week) We are only doing this once a day, aftermour lunchtime walk. would you suggest more often? I’m not sure if the dog is finding it harder as my partner and I are training him together as we’re off work together for the holidays. We know this will be a long road, he starts doggie day care three times a week next week and obedience classes next sunday so hope these distractions will make it a bit easier. Any advice on how many times we should do this on his non doggie day care days would be appreciated. At the moment he is quiet for 30 second – 2 minutes after we leave if busy with treats. When we do the training we go,outside for a minute, come back in for a minute, out again. Maybe this is wrong and we should just do ignore 20 minutes, leave for 1 minute, then ignore for 10 minutes. Thanks again for your help, it is REALLY appreciated. We have adopted a dog 2 weeks ago and noticed our dog was starting to get very clinging. We followed the advice from your post and ignored him 20 minutes before we left and 20 minutes after we came back. My girlfriend also limited the amount of overall attention and it has helped a lot. These things can take weeks. Just be consistent and patient. I know it’s very hard to deal with. Try something more tempting than the bone like peanut butter. I would keep doing what you are doing but do this a few times per day rather than just one training session. During each session I would leave for a few seconds and then return before the crying starts. Open the crate door when you return. Then put him back in his crate, leave again and return before the crying starts. Let him out of the crate again. Do this three or four times. Repeat the whole process at least twice per day. We are still persisting with this 2 minutes and not much improvement at all. We videotaped him today and he doesn’t even look at his tasty treats but paces up and down and barks and barks. Hope the Kong from Amazon arrives soon! He started doggie day care this week which he loved and obsedience classes start on Sunday. I cant wait for the weekend to spend time with the little guy and practicing what we learn in class and take him on a long long walk. It’s common for dogs with separation anxiety to completely ignore their favorite treats. Patience is going to be key for you. Building his confidence through obedience should help. The Kong seems to be working…Murphy is up to 3 minutes on his own without barking now! Only 57 more minutes to go. Feels good to be seeing progress. Thanks again for your help and support Lindsay. I’m glad he is showing some improvements! Well, yesterday Murphy managed 5 minutes with no barking, we were away for 7 minutes and waited until the crying had stopped a second before returning. It felt so good! We decided to freeze the kong so it would take him longer today, but he only managed 4 minutes. We still increased our time outside by a minute. I think he may have been frustrated he couldn’t get at the treats easier and I wonder if he missed the anticipation of the kong. He gets so excited usually when he hears me preparing it, rustling the chewy treat bag, seeing the peanut butter etc etc. I’m trying not to be disheartened. We will continue! Good signs were that in obedience class today, when the teacher held him and we walked around the circle he didn’t bat an eyelid. He seems fine as long as a human is around. Tomorrow at doggie day care he will have an hour / hour and a half alone with the daycarers dog. Would love to know how he handles that. Hello, Im having a few problems with my black labrador pup, hes almost 1 now, this month. we spent alot of time training him and potty training, and he has come along heaps and bounds, however he has started to develope certain tendencies that are causing arguements with family living in the house. When he is left alone in the kitchen he barks and pines for about 5 minutes, which is fine because he settles down rather quick. but when we come back into the room he destroys anything, for example in 7 months hes ripped apart and eaten 7 beds. these beds cost money so that causes arguments straight away. however when we try and tell him off for chewing he stops while we are there. we baught him a brand new bed but we had to keep it in the livingroom instead of the kitchen where he sleeps, the bed was in there for 3 weeks, and he was really great and didnt bite it or even bother with it, but then we moved it into the kitchen and he seemed okey, wasnt paying it any attention. we left him alone later that day for 1 hour, we came back into the room to find have the bed gone, eaten, digested. he does this with ever bed. even if we catch him and take the bed away, as soon as it comes back and we arent there (during the night) its gone by morning. i cant understand why he eats the bed when he has plenty of chew toys and even a bone for him to chomp on. another issue is that now he stops eating when we leave the room, this has only just started in the past few weeks. we give him his meal and we make him sit and wait untill we have put it on the floor and then i open the door for him to go out and do his business if he needs too. but as soon as i leave the room and shut the door so he can only stay in the kitchen and eat or go outside to the toilet. he stops eating and just sits and waits. this is alittle fustrating because i dont want him to not eat is only meal a day. so i tried to stay in the room but i didnt want to mother him and him think i would be there everytime he ate, any advice for that? the last thing is the toilet. he now doesnt go into the backgarden, AT ALL he wont go outside in the rain which is alittel fustrating because at 5in the morning when i wake up for college and i go down to say hello and let him out while i eat my breakfast, he wont go out for a toilet break, he holds it all day, even when the door is open, as soon as the door is shut and i leave the room (even) to go to the bathroom, he then lets it go everywhere, even the poo’s. which then also causes arguements with family. he goes out at least 2 times a day for a walk around the block, about 10-20 minutes. and then at the weekend we almost always go for a huge walk in the woods for 2 hours. so i just find it difficult to know what im doing wrong. or how i can help him. so if you have any idea i would be eternally grateful, and im sure my family would too. Oh the bed issue – Beds are more fun to chew up than toys. Stop giving him beds for now. Maybe in a year when he is more mature he won’t tear apart his beds. For now, he can sleep on the floor or give him some old towels and blankets. On eating – Dogs will eat when they are hungry so don’t worry so much about that. He won’t starve himself. I see your point of not wanting him to think he can only eat while you are there. You can leave his food out for 10 minutes while you are getting ready to leave for school or work and then put the food away until his second meal time in the evening. Just give him 10 minutes at that time as well. If he doesn’t eat, no big deal. Put the food away. He might not eat for a few days but he will eat when he is hungry. This routine will help him get on a schedule. For potty training, go back to the basics. Take him out on a leash as often as you can, and reward him with his favorite treats for going to the bathroom outside. Glad you are making some progress! I hope the daycare helps him! Thanks for being so patient! We had some digression this week, only 4 minutes. I know it’s a problem we only practise this on the weekends but he had day care in the week. I will have to start doing this throughout the week as well I think. I guess it is not really fair to expect him to grow and develop this if he only gets two opportunities each week. Lindsay, what are your thoughts on SA being linked to the time the dog spends with you? In the evenings we do have the dog on the sofa with us and he gets cuddles in bed in the morning and evening. We are getting rid of his crate this week. The dog is perfect apart from the SA. Just feeling a little disheartened! I think you have to find the healthy balance between spending enough quality time with your dog (cuddling/training/exercising) and decreasing their dependence on you. Thank you for this article! I was feeling terrible as our new puppy barked in his crate but now I know this is the hard adjustment period. Thank you thank you thank you! Glad I could help! Best of luck to you with your new pup! What kind of dog is he/she? I have a 7 year old chihuahua and he was kenneled until he was 4 and now I’m kenneling him again due to new living situation. He loved his kennel as a puppy and would jump in there in anticipation when my shoes went on! Now, he rubs his nose on the bed, blanket, or whatever object is in there and is covered in blood!! I don’t know what to do so I’m just sticking with with putting him in there everyday hoping he’ll stop but he’s not slowing down. Please please, any advice? Am I doing the right thing? Do you have the option of putting him in a smaller room like a bathroom or not really? I would stick with the kennel unless he is severely hurting himself. Try to keep it stocked with all kinds of puzzle-type toys and other goodies to keep him distracted. Increase his exercise, too, so he will be tired in the kennel. No a smaller room isn’t an option for us and maybe a bigger kennel will help so I can fit more toys in there but he doesn’t really take to toys. He gets better one day and then the next he does it again and I don’t think the damage he is doing to himself is something to worry about anymore on a safety stand point because the area isn’t growing it’s just the top of his nose now and I can see new hair growth. We really appreciate your website here you have really put our minds at ease. I have a 9 week old boxer puppy that we brought home 4 days ago. So far we have had two good nights and one really bad one. We ignored his crying last night and he seemed to manage okay. My bigger worry is during the day. I have to go back to work next week. I’ve been regularly taking him downstairs and locking him in the laundry with the door open to outside (this is what we’ll do when I go back to work). So far I’ve pushed the time alone for him out to 2.5 hours. He’s been asleep for the first 15, woken up and cried for 45, settled for 30, then cried again for the last hour. He’s then started to get himself quite worked up so I’ve gone to get him- I don’t want him to associate the laundry as a “bad place”. I’m careful to wait until he’s quiet until I let him out though. I also spend other time down there with him – either playing or not paying attention to him, doing the washing etc. I’ve filled the garden and the laundry up with heaps of toys – ones that he’ll happily entertain himself with when we’re nearby but just isn’t interested in when he’s by himself (I’ve been watching him – very quietly – from the balcony). At the moment though, I just can’t imagine being able to leave him for the whole day while I’m at work! Am I being too lenient, or expecting too much? When can i expect him to lose the whining? Any other hints and tips? Keep leaving him alone for short periods and going to him when he’s quiet like you are doing. I would rotate which toys you give him when he’s alone. If he only has certain toys out, then the “new” ones will seem more valuable to him. They will be more interesting. Find some puzzle-type, treat-dispensing toys or other chews that he absolutely loves. A whole day would be a long time for him to be alone. Will you be able to return during your lunch break? Still, I don’t think you are being too lenient. He has to slowly get used to being alone. Thanks for your great advice. Just thought I’d let you know that he soon settled himself down and learnt to play by himself. It probably took him a couple of weeks to settle down but I just wanted to give everyone hope that patience and persistence pays off! Hi! You have so many great tips! My fiance and I have just started working with our German Shepherd who is overly dependent on us. We have started ignoring him when he gets too excited, we practice leaving him alone for shorter periods of time, and only reward him once he is calm. We were wondering if making him sleep in a different room would help him feel more independent or will it do more harm to switch up his routine at this point? He has slept in our bedroom for the past 2 1/2 years that we have had him. Is there a gradual way to switch his sleeping routine? We really want him to feel comfortable by himself, but we want to do it without making the situation worse. We would really appreciate any suggestions! Thank you! You could try having him sleep in another room. Does he sleep in your bed or does he sleep in your room on a dog bed or in a kennel? If he’s sleeping in your bed, I would start by moving him to the floor. Then you could try having him sleep in the hall outside your door or in a bedroom close by. If he makes a big fuss out of being away from you at night, you may want to put him in a kennel as far away from your bedroom as possible. And if he whines or barks so much that you can’t sleep, then maybe just let him sleep with you. It’s not worth losing sleep over. Just work on lessening his dependence on you during the day. Is he able to lie down and stay for up to a half-hour at home while you go about the house doing other things? That would be one goal to shoot for. Start with a few seconds of course, and slowly progress from there. I’m feeling guilty as we’ve stopped doing the kong separation training- and just decided to ‘get on with it’ our dog has day care in the week when we work and on the weekend we are with him all the time anyway. Of course there will be times when he can’t come with us, but not much arises like this. I think he is more attached to my partner as sometimes when she leaves he let’s out a couple of barks but settles easily. They spend the most time together. This week our day care plans fell through, and we did split shifts caring for him, with a period in the middle of the day when he was alone. My partner came home and he wasn’t barking- it had been about 20 minutes!! And when she came back, she sat downstairs and he was still busy upstairs with the kong. Result! So this is why we decided to just forget the training. I think we were always anxious when preparing the kong and the two of us busy acting as if all was fine and standing outside. He has a new toy where you can give him all his dinner and he has to tap it, which he loves. So think this week we will fill that before his dinner and pop out for an hour. We do need a life! Are we mad not to continue with the kong practise?? It sounds like he is doing much better. I would go ahead and use that other toy you were talking about. I understand what you mean about feeling anxious when you are preparing the Kong. I’m glad the daycare option works well for your schedules and that he’s not alone too often. I think you are doing all the right things.